The Bug Genie 4.2 released! 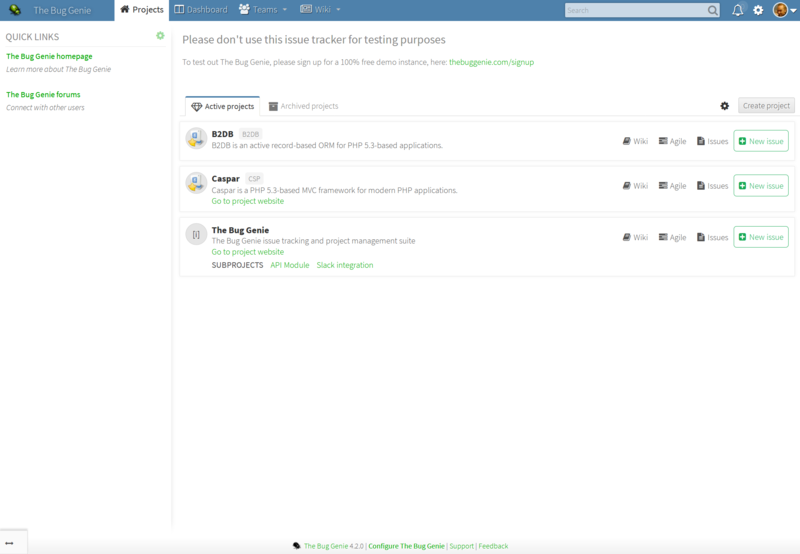 The Bug Genie version 4.2 is now available, with unified theme, project templates and improved user onboarding. The Bug Genie 4.2 RC2 released! There are no other changes since RC1. Please test this release and report back with any issues you find. This post may be fairly technical, but considering the main target of a bug tracking and project management software suite, I think you will all do just fine. The Bug Genie is an “old” project – when it comes to code, some of the concepts used and when it comes to people. By people I mean old people, like your eccentric grandmother who only brushes her teeth on Wednesdays and smells like rosemary. In a good way of course, The Bug Genie is like that. The codebase for the current release version of The Bug Genie was started at a time before there were established PHP coding standards and best practices. Before Github, Composer and many other frameworks were even available, before PHP 5.3 was released there was The Bug Genie. What am I getting at? Read on for more details. This blog post will start out with an apology. The Bug Genie version 3.3 has taken considerably longer to finish than I first imagined. Most of you who follow The Bug Genie are familiar with software development. As is often be the case when you are working on a growing project, areas of the code and the application needs to be improved and added to, in order to both maintain scalability, usability and to add and improve features. The Bug Genie has been at a stage where a lot of the backend code needed to be refactored and to be improved. There are several things and features with The Bug Genie that are really awesome, but there are also quite a few areas where we simply aren’t doing our best. Notifications, authentication, permissions, file uploads, mobile – these are just to mention a few. In the age of html 5, usability first and “competing” software improving at a rapid pace, The Bug Genie needs to both lead and follow. Lead, by showing that open source issue tracking and project management can look – and be – as good as proprietary alternative. Follow, by not lagging behind in features or usability. Version 3.3 started out as a medium-sized improvement over 3.2, about the same as 3.2 was over 3.1. There was a time during 3.2 development where using 3.1 was becoming a pain. The improvement in features and functionality in 3.2 was just too much to keep using 3.1, once you’d made the switch. This is where 3.3 has been for several months. Version 3.3 – as an improvement over 3.2 – is more than finished, but it’s not there yet. There are still things that needs to be addressed, improved and changed. I’d like to keep improving and fixing, but at some point you gotta say “dude, release it already”. 3.3 just won’t be all it has been promised to be during the last year of development. Too much time has gone since we started, and too many things have happened to keep our initial targets. But it will be a great improvement over 3.2 – so much, in fact, that I can almost guarantee that you will have no reason or desire to switch back. Now, for the update. During the last couple of months, the search frontend and backend have seen a complete rewrite with focus on finding issues immediately, instead of old-style “searching”. You’ll see what I mean once you get your hands on the beta. Also, mail notifications have been improved, with the introduction of “notifications”, and a much simpler notification setup for email notifications. In addition to that, a great number of improvements are happening in the backend to improve performance and security for all our users and usecases. In addition to this, the default theme has seen several tweaks and changes to improve readability and usability. I’ve attached a couple of screenshots of how it currently looks. Keep in mind that some of this may still change, but I think it’s starting to look solid. I hope you like what you see – and if you want to help out with development or testing, feel free to check out the master branch on github.com/thebuggenie – pull requests are highly appreciated.